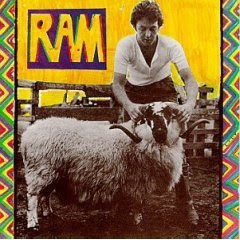 This is my favorite McCartney solo single, right back at the earliest stage of his solo career. I remember it having such an impact on me when I first heard it, wanting to hear it over and over again on the FM radio because of its wonderful soundscape and overdubs. 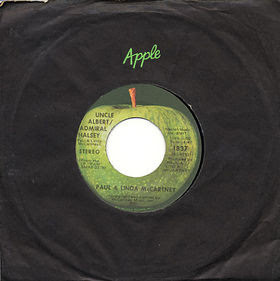 Technically, the single was credited to "Paul & Linda McCartney," truly a thumbed nose at the critics who thought his wife was a mere hanger-on. Although I'd be hard pressed to see what her contributions where. McCartney always had this penchant for merging two or three song parts into one. With the Beatles, it came full force on side two of Abbey Road, where "You Never Give Me Your Money, " "Sun King," "Mean Mr. Mustard," "Polythene Pam," and "She Came In Through The Bathroom Window" all blended effortlessly into one suite. His most famous single, "Band On The Run" was like three song fragments in one... and there are countless examples on many of his albums with Wings and without them. I often wondered if he consciously planned them this way or they were all originally song odds and ends that he just surgically stitched together to make one really good one. Why hasn't anybody asked him this? Much like I mistakenly thought the Rolling Stones recorded all their 60's hits in England (it was in Chicago and Los Angeles), I found out many years later that McCartney recorded "Uncle Albert/Admiral Halsey" at the RCA Studios in Manhattan with some of the city's best studio musicians. It's a miracle that none of the slickness and precision of "studio cats" or a "New York City" sound seeped into this record. McCartney threw every one of his musical production tricks into this song -- peculiar English-sounding character sketches, megaphone vocals (a la "Yellow Submarine"), sound effects, strange babble, and a good deal of whimsy. The first "Uncle Albert" part is the better half, starting cold on McCartney's vocal, afloat on swirling Am7-D chords, with the bass remaining on the A note, then cooling down to a Gm7-C, Caug, and then D. The cellos and violas glide underneath, brushing against their strings. But we haven't done a bloody thing all day. But the kettle's on the boil and we're so easily called away. I was 14 when I not only bought the single and played it repeatedly on my phonograph, but I paid for the sheet music. In retrospect, it was not the most difficult song to figure out, but I had to dissect it any way I could. As these were the waning days of my piano lessons, I basically forced my senior aged teacher, a little old Italian lady, to play the song straight from the sheet music, even though she didn't know it from a hole in the wall. I remember she was doing the "sea chantey" instrumental horn part of the second half, pointing out the "legato" symbol over the notes.